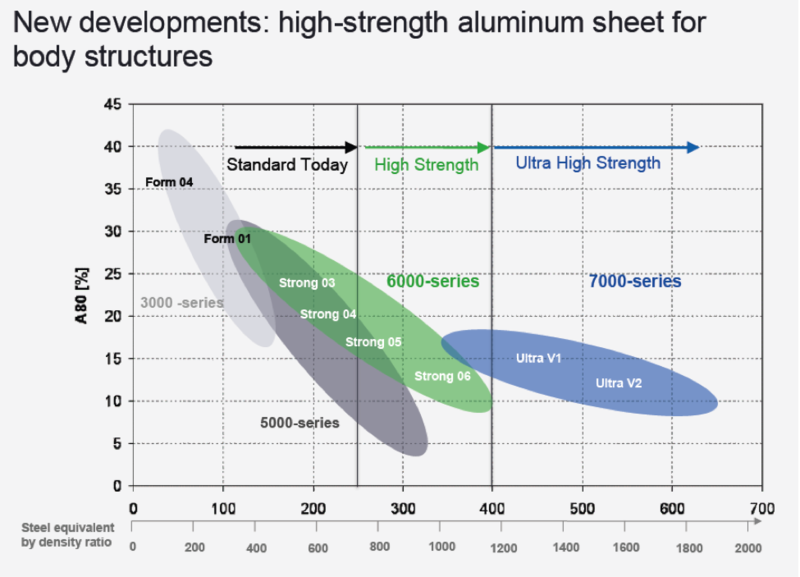 Looking at the flurry of announcements of new aluminium alloys developed by some of the big aluminium producers (Novelis, Constellium, Norsk Hydro, Alcoa, and UC Rusal), it almost seems that OEMs didn’t actually know – until recently at least – how the metal can be improved in terms of both strength and ductility by using advanced alloys. But thanks to the ongoing evolution of production processes, new blends are speeding along a cost-effective mass-market shift from steel to aluminium, which is especially noticeable in the automotive industry. While most think of the lightweighting properties of aluminium as the main reason for this shift, automakers are equally interested in the metal’s good durability, superior corrosion resistance, as well as improved maintenance thanks to new tools and techniques. To reach and improve upon those goals, OEMs have started researching new aluminium alloys that can enable even higher strength and ductility than older aluminium series. But not all news articles extolling the virtues of new aluminium alloys and their production techniques should be seen as reliable: some releases are just adverts for certain companies or are merely promoting half-baked ideas that may not even come to fruition. The truth is that all leading aluminium producers and processors have, alongside the usual mixes, their own proprietary alloys, used especially in aluminium-intensive industries such as packaging, automotive, aerospace and constructions. In a field crowded by so many different alloys, separating the products with real added value from publicity stunts is therefore no easy task. 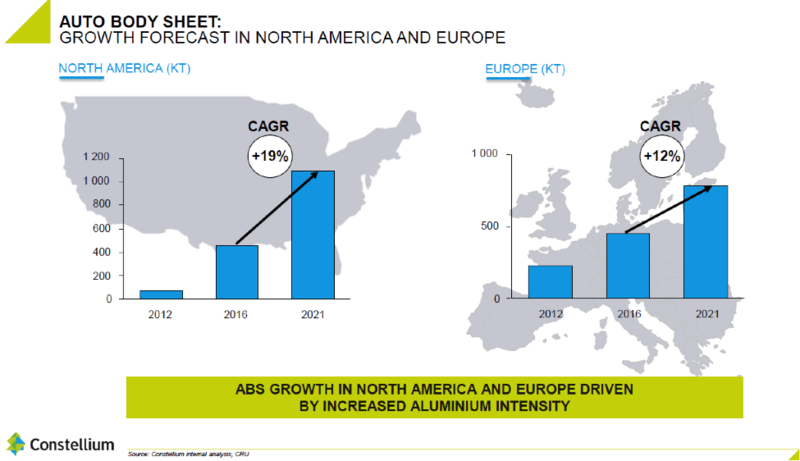 This overview is intended to serve as a backgrounder on some of the main aluminium alloys used in the automotive industry and flag the latest research trends. Alloys for use in the automotive industry are classified in several categories: cast, extruded and rolled alloys, each meant for different parts and positions in vehicles. Depending on their chemical composition and properties, automotive alloys are designated by series (mostly 6xxxx and 5xxxx). Each series contains numerous variations and subgroups, depending on composition, manufacturing techniques and the tempers (exp. T4, T6) of various alloys. According to Innoval Technology, the supply balance between AA5xxx and AA6xxx automotive sheet alloys is tilting more and more towards AA6xxx alloys. The transition is promoted by OEMs demanding higher strengths, which are more readily achieved using the AA6xxx alloys. The AA6xxx alloys represent at least 80% of the presently supplied volumes to carmakers. While 5xxx series alloys have excellent strength-to-weight ratio, formability properties and full recycling compatibility, 6xxx series have the upper hand as they are versatile, heat-treatable, highly formable and well weldable. Aluminium alloy AA6016A, with excess silicon content originally launched by Alusuisse at the turn of millennium is mainly used in Europe for external panels in vehicles. Most of the major aluminium sheet suppliers such as Novelis, Aleris, Constellium, Hydro and Amag produce the AA6016A. The AA6111 alloy is used in aluminium intensive models developed by Jaguar and Land Rover, with copper as an alloying metal (copper level of 0.5 to 0.9 wt%) and is even stronger than AA6016A, though a little less corrosion resistant (this alloy is more common in USA). Other than their innate chemical properties, there are various techniques that give finished alloys their final characteristics, such as: bake hardening, work and precipitation hardening, heating, annealing etc. Those processes can provide endow an alloy with specific properties like higher strength, formability or hemming quality. AA6016A is a less strong but more formable alloy that has a lower bake hardening response than AA6111. The OEMs use AA6016A at relatively thicker gauges compared to AA6111 to obtain the same level of dent resistance. The use of AA6111 enabled Jaguar, and then Jaguar Land Rover, to use thinner closure panels than most German OEMs. Next, alloy AA6451 combines the features of both AA6111 and AA6016A (copper < 0.4 wt%). It is the same alloy Novelis promotes for external panels under the name Advanz e600. This alloy is Novelis’ favoured alloy for production from recycled scrap. Advanz e600 is a heat treatable, balanced alloy specifically designed and optimized for high-strength requirements, both for skin and structural applications. It has excellent strength in T6 condition, achieving strengths of around 350 MPa, making it ideal for structural applications in chassis and cross member components. AA6181A was added more recently thanks to recycling aspects. This alloy is mostly used for outer panels in gauges of 0.9−1.0 mm for parts that require high strength with good formability. Alcoa’s alloy of choice for outer panels is AA6022, which was first marketed in 1996 as an alloy with the strength of AA6111 and the formability of AA6016A. However, AA6022 is a low copper (< 0.11 wt%) and iron alloy (< 0.20 wt%), making it difficult to produce from recycled stock, rendering it less popular for producers. Following Alcoa’s split into upstream and downstream businesses, AA6022 remains available from Arconic. AA6061, used in car steering knuckles for instance, has an average tensile strength of 383 MPa and elongation 10.7%. The alloy was optimised by adding minor quantities of zirconium, zinc and copper. Another well-established alloy with high magnesium content, AlMg5Mn (AA5182), is used for high strength and complex stampings, for inner panels, offering corrosion resistance and high formability, while its sister alloy AA5754 offers superior surface quality and is used in structural sheet applications. Novelis has recently started supplying Jaguar Land Rover with RC5754. This alloy has increased allowances for iron, copper and silicon, allowing the company to make it from 50% production scrap returned from pressing plants. Aleris, for example, incorporates 71 % recycled content in its transportation 3004 alloy, mostly used in truck trailer sheet, horse trailers and irrigation pipes. The common thread linking these developments together is that the number of aluminium alloys produced from recycled aluminium is increasing, a trend that is expected to continue well into the future. On top of their ‘green’ credentials, and depending on alloying content and temper, these alloys achieve between 350 and 390 MPa tensile strength, with 10.5-11 % average elongation. Now let’s turn our attention to alloys that are currently being developed or are in testing phase. These alloys include 1580, a new, high strength Al-Mg alloy developed for UC Rusal by scientists at Siberian Federal University (SFU). It contains a record low percentage of scandium (0.10%) and zirconium, which has slashed production costs by more than US$ 3000 per tonne. ACMZ needs further testing and development before it appears in the makeup of an engine. 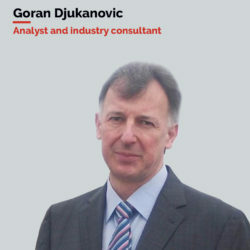 Another recent innovation in alloy technology comes from Arconic’s Enduralum, an exceptionally strong (tensile strength of up to 460 MPa) aluminium fastener designed for thermal and galvanic compatibility with next-generation aluminium and magnesium castings in automotive powertrains. The super lightweight, heat-treated AA 6056 alloy of Enduralum helps reduce overall weight while maintaining a reliable clamp load. Another proprietary blend from Arconic is the C6A1 alloy, used by FCA, which allows automakers to create high-form lightweight design solutions in applications that require strength and durability. Norsk Hydro recently introduced three new aluminium alloys (5083, 5456 and 7020 alloys) in order to improve the superplastic forming process by reducing the process time and rendering them more attractive to the automotive industry. These alloys are specifically meant for the hot-metal forming of aluminium sheet, for complex automotive components. They boast higher elongation, achieve higher post-forming tensile strength and enable lower cycle times than today’s alternatives. Most of the major suppliers are now developing AA7xxx automotive sheet alloys in an attempt to meet the higher expectations OEMs have for greater strength. However, the AA7xxx alloys (with additions of Zn), aside of higher cost, have to overcome both corrosion and stress corrosion issues, particularly for alloys that are conventionally weldable. Consequently, the AA6xxx alloys remain the predominant materials used in automotive applications for now. Welding of aluminium alloys with each other, or with other metals, is also an issue that needs further technology improvements and innovations. Recent discoveries have lead to the conclusion that this problem will soon be overcome, which would consequently accelerate their adoption by auto manufacturers. Factors such as tool geometry, choice of welding parameters, post-weld heat treatment (PWHT), workpiece thickness, thermal cycle during welding, and auxiliary cooling greatly influence the resultant microstructure and strength of the weldment. A team from UCLA has managed to weld two parts of AA7075 by using conventional Gas Tungsten Arc Welding (GTAW or TIG to most) techniques, a fast, cheap and reliable way to stick together even small, complex shapes, not only sheets or tubes of the alloy. Bars of this super strong alloy have a post-weld join strength of 96% of the pure materials, and yield an impressive 550 MPa tensile strength after heat treatment. Alcoa’s EverCast alloy C862F (Al-Zn-Mg) is also part of the 7xxx series. Compared with conventional 3xxx casting alloys, this one eliminates brittle silicon particles, allowing for better properties. The result is significantly higher tensile and fatigue strengths (400MPa T.S.) compared to the traditional A356 alloy, with properties equal to or better than most 6xxx alloy forgings. EverCast achieves excellent fluidity and resistance to hot cracking and shrinkage formation. Recent research also showed that overaged copper containing 7xxx-series alloys provide robust crack and corrosion resistance in tests. The 3rd generation of Al–Li alloys (aluminium-lithium) could also become integral to various components of luxury cars thanks to their excellent combination of low density, high strength, high stiffness, and excellent damage tolerance. In the past, these alloys were reserved for use in the aerospace industry. A good example of Al-Li alloys is Constellium’s Airware family, which includes the 2195 and 2050 alloys, both designed specifically to meet the needs of the aerospace and defence sectors. Over the past ten years, Airware alloy 2050 joined 2195 as a preferred plate material for both pressurized and non-pressurized structural components used in space launchers and crew modules requiring a thickness range of 1.27– 1.65 cm. Aluminium alloyed with scandium creates an extra strong, lightweight alloy with excellent resistance to corrosion and has good weldability. What’s more, it preserves its characteristics at higher temperatures, especially in combination with zirconium. Even a small amount of scandium in aluminium alloys substantially enhances strength and makes it more resistant to corrosion. These alloy properties can be achieved with scandium additions in the range of 0.1 to 1.0% by weight. Thanks to its fine grain refinement, Al-Sc alloys reduce hot cracking in welds, increase strength and delivers better fatigue behaviour. While these alloys are rather expensive (several times more than aluminium), and more focused for applications in the aerospace industry, further developments and decreasing scandium costs will increase their use in the automotive industry. Recent investments in scandium mining (especially in Australia) will hopefully lead to price levels that are acceptable for automakers. If conventional alloys tend to be cheaper and are increasingly relying on recycled scrap to achieve lower costs, the crop of cutting edge alloys is substantially more expensive, making them too pricey for most automakers. However, their price point is expected to decline in the future due to things like higher commercial use and higher availability of alloyed metals. Once that happens, automotive producers will be much more likely to adopt them. A final allow worth mentioning is the so called “super aluminium”, promoted by Nano Al. 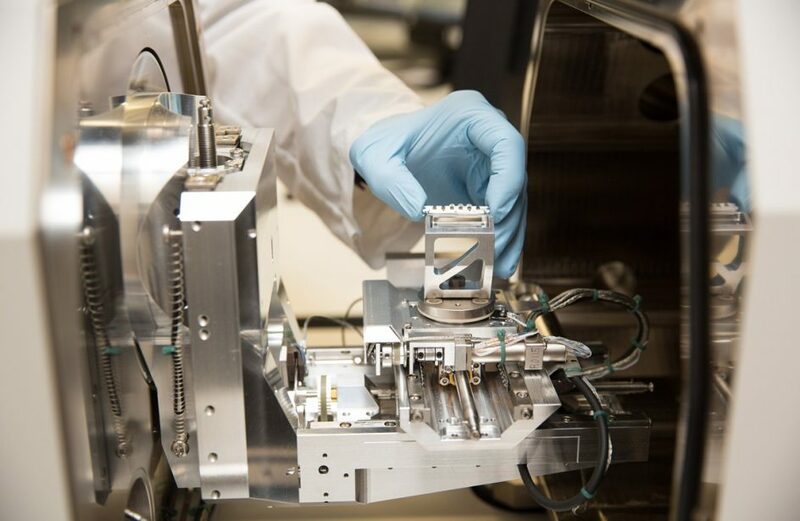 As was the case for steel, this super metal is the result of a proprietary nanocrystal embedding production process that promises to yield 20% strength increase and weight saving, compared to standard automotive aluminium alloys. Discovering and commercially adopting new aluminium alloys is a long and arduous process. In recent years, this has been helped along by more powerful computer software that can calculate the effects of alloying elements and predict the behaviour of a certain alloy, based on its chemical composition and alloy improvement procedures after production. New, superior and improved aluminium alloys have become – and are likely to stay – the main lightweighting materials in vehicles. The only obstacle remains their relatively high price compared to steel, but still affordable compared to carbon fibre reinforced plastics (CFRPs). What’s more, prices are expected to decrease in the future thanks to increased use, new recycling procedures and techniques as well as lower input costs (Sc,Zr,Li etc). The deciding trend that will dominate aluminium alloys characteristics in the future for automotive OEMs is superplastic forming. The process enables aluminium manufacturers to produce thin-walled aluminium sheet components. It is a cost-effective process that can stretch the sheet at over 200 % above its original size, while maintaining or even improving tensile strength. Another trend, though not correlated to the first one, is the increasing presence of recycled scrap content in future aluminium alloys used by auto industry. The takeaway from these two trends for smaller primary aluminium producers around the world that are barely surviving in the current low price market environment or are coping with losses is simple. Look at potential buyers and then find or select one or two of these higher cost aluminium alloys in rising demand, and gear production towards them. If such smelters manage to offer the alloys at more competitive prices than leading producers, their success will be guaranteed.